We stayed in the Gulf of Volos for a few days and we're now on our way to Skyros, the most southern outpost of the Northern Sporades group of islands. We've had thundery and cooler weather for most of the last week. The winds haven't been very strong so shelter hasn't been a real problem but we've had quite a bit of rain! In Amalioupolis we anchored off the village and rowed ashore to find a sleepy but very welcoming place. We walked up the hill to look over to the west where there's a very sheltered anchorage called fearless cove, but it didn't look worth the detour. There's a naval base North of Amalioupolis and the description of the coast in the pilot is not very inviting so the next day we went to the east side of the Gulf of Volos, motoring in little wind. 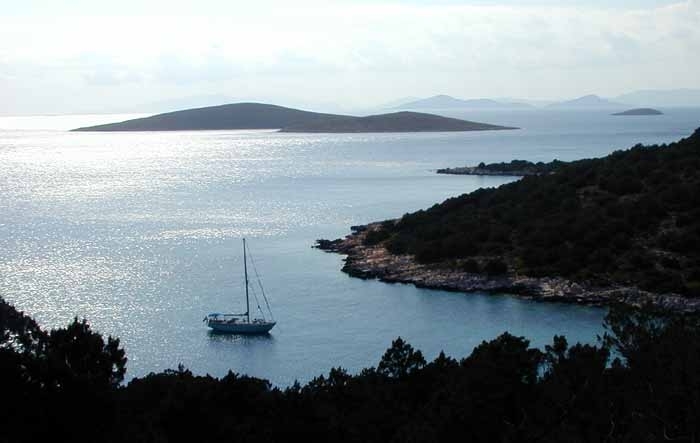 The Pelion peninsula on the east side of the Gulf of Volos is very attractive, green and cultivated. We anchored in Vathoudhi, a large bay where Sunsail have a base. There were a lot of other yachts on long-term moorings there and it's a pleasant spot, quiet except for the minor road running along the shore. 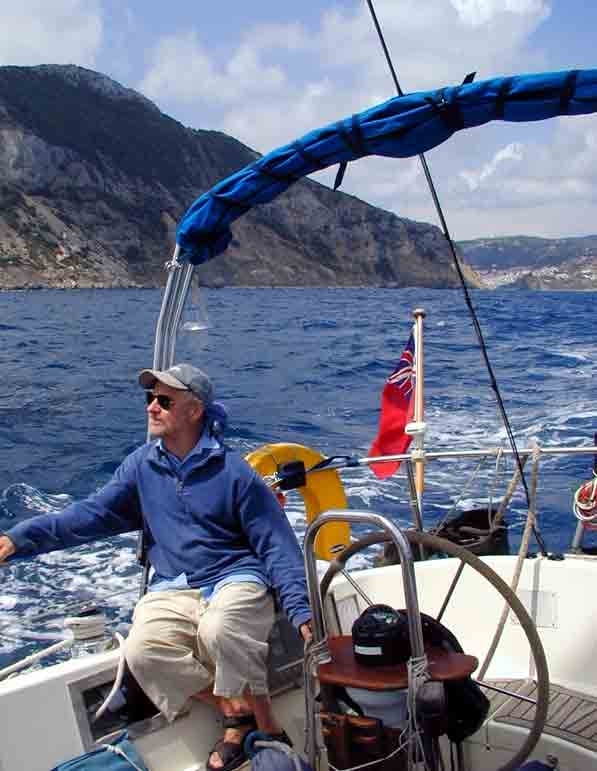 From there we sailed west again to the entrance of the Gulf of Volos and explored a deep bay running west, where we would be well sheltered from the stronger winds that had been forecast around that time. We ended up staying for three nights at Ahilio, anchored off the village under a new breakwater, sheltering from the rain and the stronger winds that didn't materialise. It was another sleepy spot, with green and cultivated surroundings, including very orderly olive and citrus groves. We finally left the Gulf of Volos on Saturday, making our way east towards the north coast of Evvia, the large island that runs from northwest to south east along the coast of mainland Greece. Again, there was no wind for sailing and we planned to visit Pefki, a small harbour on Evvia. Pekfi was full of fishing boats and there was little room to anchor so we kept going to the little island of Pandikonisi, where there is just enough room for one or two yachts to anchor. It's also a popular spot for small fishing boats as there were a few coming and going, arguing amongst themselves over a permanent mooring that had been laid inshore. They didn't seem to be catching much, just like us. We've only been able to catch plastic bags so far and are doing our bit to clean up the Aegean with our fishing line. From Pandikonisi we managed to sail most of the way, yesterday, to Skopelos. As we got nearer we could see a lot of yachts coming from the NE, with spinnakers flying. 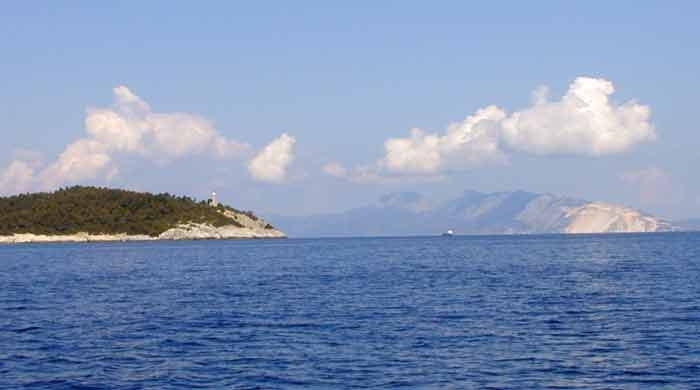 As we got closer to Skopelos town we realised they were headed for the same place. It was lucky we got there when we did as we would have had difficulty finding a berth. By 8pm the harbour was full, with the racing yachts parked 3 or 4 deep off the quay. We didn't manage to find out much about the race but the town was full of racing yachties, a breed who seem the same the world over, except these ones were speaking Greek. Despite all the festivities we slept well, having eaten more than necessary in the same excellent taverna we found when Helen and Paul were with us. Today, the winds were forecast to be northerly F5 today, just right for our sail east. After a bit of shopping we set off, managing to hoist our mainsail in the harbour despite a very large ferry wanting to leave at the same time as us. The seas were a bit choppy just outside the harbour but we were soon making good progress, up to 8 knots. We had one of the best sails of the season so far, across to the uninhabited island of Skantzoura.